It’s 4:00 AM, and the departure hall in Istanbul is crowded and humid, bustling with activity despite the hour, and I’ve resigned myself to sitting on the floor with my cup of hot tea, bought mostly to occupy my hands, which are shaking with nervous excitement. Three months prior to my midnight arrival at Ataturk Airport, I made the decision to apply for a journalist visa to go to Iran, without ever thinking it would really come to pass. 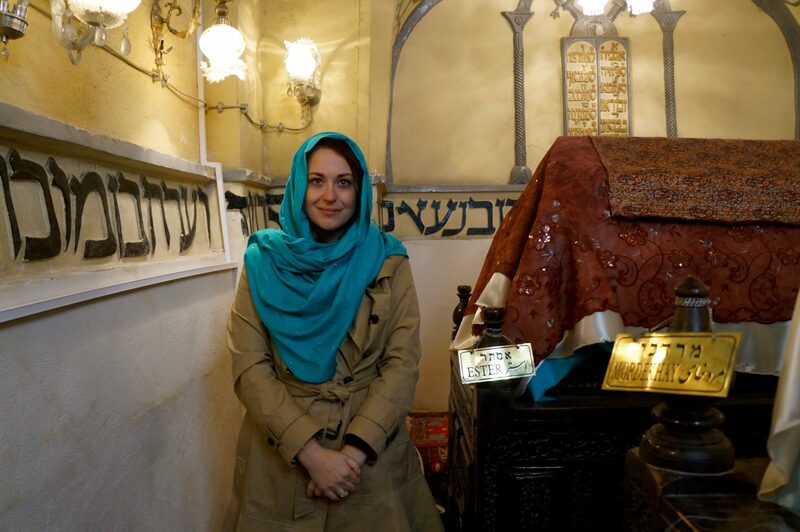 I dreamed of visiting one of the most elusive Jewish communities in the world, of getting behind the veil of this ancient culture, but through all the arduous paperwork and embassy interviews that pushed the process forward, I kept the reality of entering Iran far from my mind. Persian Jewry dates back over 2,700 years, to the reign of the Persian Empire in 539 BCE, when Cyrus the Great conquered Babylon. But despite their proud ancestry, the Jews of Iran remain isolated and largely unknown to and undiscovered by the rest of the world. At its height, just ahead of the Islamic Revolution, the Jewish community in Iran numbered approximately 80,000 individuals, and they were thriving. Overwhelmingly middle- or upper-middle class, the community boasted a wide array of educational and cultural institutions alongside at least 30 active synagogues in Tehran alone. While the ancient Jewish community had been growing steadily under the protection of the Shah, the Islamic Revolution brought on mass emigration, reducing the community to a tenth of its original size. The advantages the Jews experienced under the rule of the Shah—high socioeconomic status, strong ties to Israel and the United States—became liabilities in the age of the ayatollahs. As in many other dark eras in Jewish history, the Jews were accused of stealing the country’s treasures, and flyers were circulated throughout Tehran urging vengeance against them. There was mass confiscation of wealth along with rampant anti-Semitism and violence against the Jewish population, and as the streets filled up with hordes of people chanting “death to America” and “death to Israel,” many Persian Jews fled to those very countries, bringing what they could with them to start a new life far from the home they once knew. Some of the Jews who remained in Iran decided to embrace the revolution and the nation’s new rulers. Some 5,000 of them even took part in welcoming Ayatollah Khomeini, the future Supreme Leader of the country, when he returned from exile in Paris on February 1, 1979. The Jewish welcome committee led by then-Chief Rabbi Yedidia Shofet carried banners supporting of the Ayatollah and chanted “Jews and Muslims are brothers” as a sign of allegiance and hope. The hope didn’t last long, however. Habib Elghanian, the official head of the Jewish community of Iran, was publicly executed later that year, accused of spying for Israel. The flight is half-empty and I’m fiddling with my black hijab, carefully folded up in my purse, my headphones filled with the music of Israeli singer Ehud Banai, as if I am holding on to the comforts of home until the very last minute. 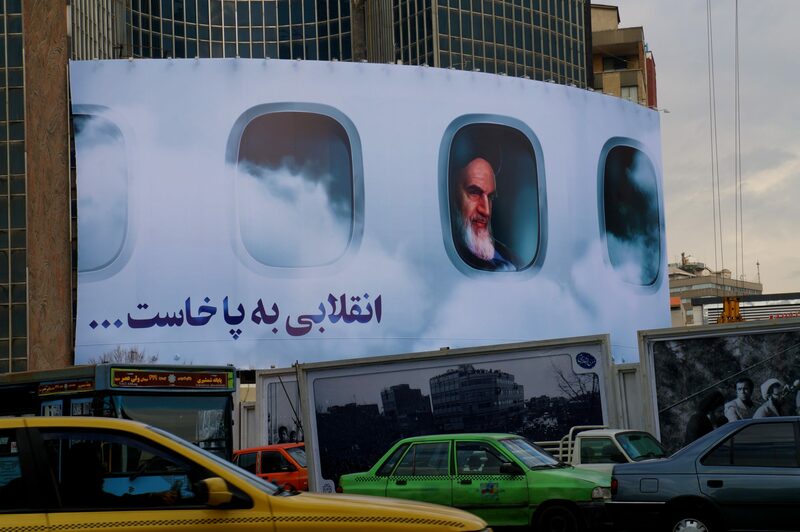 As the plane descends there is a rush for the bathrooms by women hurrying to put on their head-coverings before reaching Imam Khomeini International Airport and the regime’s ever-watchful eye. I join them, folding and pinning the fabric as I’ve practiced in front of the YouTube tutorial, and when I meet my own gaze I do a double take at the woman in the bathroom mirror, immediately more humbled by the heavy cloth and the weight of the meaning it holds. 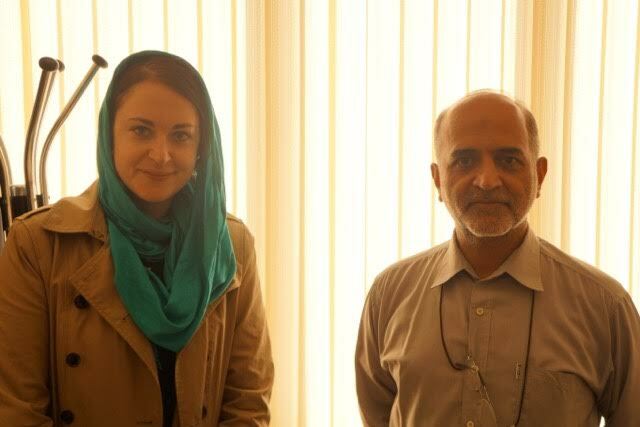 As I am traveling to Iran as a journalist, I am appointed a driver and a translator, both employed by the Ministry of Culture and Islamic Guidance. It’s a mandatory service, and these young men are to stay by my side throughout the 20 days of my stay. I am picked up at my hotel each morning and dropped off at my door at night, and at the end of each day there is a debriefing at the ministry where we are taken aside and spoken to separately in order to make sure our stories match. The “limits of the law” mentioned by the constitution is a larger issue than the humble passage lets on, as it applies to the Sharia law that has ruled the country since 1979. In other words, despite being a recognized minority, Iranian Jews are still ruled by Islamic law, and if broken the consequences of that law are as permanent as they are dire. 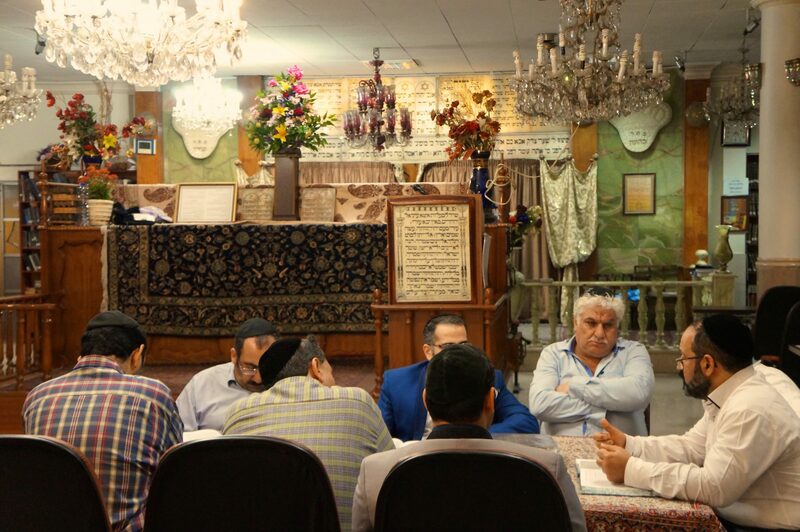 One example is the oppressive inheritance law, which states that any Jew who converts to Islam automatically inherits the assets of their extended family, potentially impoverishing many Jewish families. During my meeting with the Jewish MP, Dr. Moreh Sedegh, he told me that the issue is being addressed in talks between him and the regime. But should it be solved, it does not change the framework that holds these Jews hostage or the regime that is the arbiter of their fate. 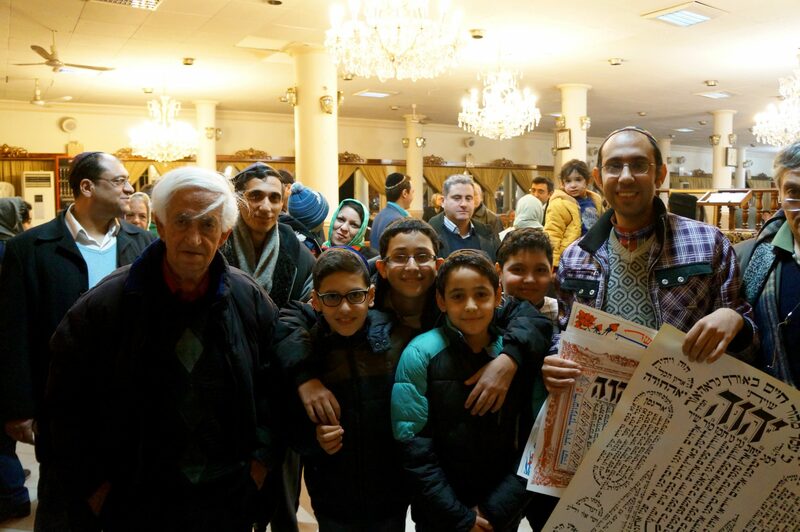 I’m taken to the Jewish community center in Tehran, located on the third floor of a modern stone building on an unassuming corner street in north Tehran, which is home to most of the city’s 7,000 Jews. I see Hebrew writing on the walls, an old man is making chai in a quiet kitchenette, and when I greet him with shalom aleichem he stares at me blankly and then quickly turns his back. My Muslim interpreter shrugs and points to a room at the end of the corridor, where a man in a bright blue suit is talking on the phone in smooth and rapid Farsi. I silently curse myself for never properly learning the Ve’ahavta section. I stare straight at him as I struggle through the lines with increasing discomfort, my government handler observing the exchange with a subtle mix of annoyance and amusement. “Should I call you Annika or Channa?” Yoram asks as I finish, smiling for the very first time, and I exhale when I realize I have passed the initial test. The Jews of Iran are loyal to the regime, and we were actually the first to volunteer for the war against Iraq. Jewish and Muslim traditions have mixed, in some ways, where Passover mimics the Persian holiday of Nowruz and the traditions of modesty are in accordance with the Muslim tradition perhaps even more than Jewish tzniut. We are Iranian Jews, and that means Iranian first, and we are loyal first and foremost to this country while remaining Torah-true. The words flow from his mouth with such fluency that I can’t help but feel they are not only far too deliberate, but oddly well-rehearsed. He speaks of loyalties and I can see why he does so, as I have brought an agent of the regime into his somewhat protected space. Jewish life here comes with carefully constructed rules and understandings, and one of the basic tenets involves separation from and defamation of Zionism and Israel. Outbursts of loyalty to the regime are expected, whether in the form of volunteering for a war or sharing an enemy, and that aspect of Iranian Jewish reality is something I as a European Jew can relate to and fully understand. It is clear that the Jewish community lives with a constant level of suspicion toward outsiders and insiders alike, always fearing treachery and infiltration; and much like in the Soviet Union, people are trying to weed out informants, unsure how to tell friend from foe. In short, there are no real answers, only truths in the untold, and I realize that for this man there may be a hefty price attached to every word and every answered question. I ask him about Israel, even though I know whatever answer I get will be measured and made to fit the party line, because I want to know what the Jewish state means to Iranian Jews and if the ban on travelling there has really been lifted, as was reported back in 2013. Before I leave, Yoram asks me to join him at his synagogue for Shabbat services the next day and then dinner at his nearby home in order to meet more members of the community. 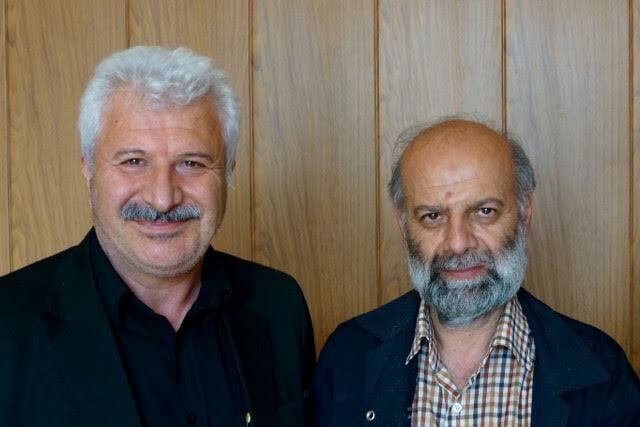 As I accept as profusely as I have been taught is the custom here, Yoram makes a point of inviting my translator as well—as if he is pretending that the man’s presence is optional and not a symbol of the chains he cannot break. An older black-haired woman is waving at me from behind the mechitza, the divider separating the genders, and urging me to come and sit down. As I approach, she introduces herself as Yoram’s mother, and within minutes I am greeting all the women in what I gather is the “honor row” where elegant women of some seniority are seated. The century-old Abrishami synagogue is located on Palestine Street in north Tehran, housed in a beautiful stone building that includes a fine kosher restaurant, a ritual bath, and the busy Tehran Yeshiva. Every day there are two minyanim, and on Shabbat the synagogue welcomes around 250 people, filling it with the same warmth and airlessness that I know from my temple back home. And it is like home to a surprising degree, down to the same music and characters and faces: The nosy women who immediately ascertain my marital status, the off-key men singing harmonies on the familiar liturgy, and the beautiful children running wild in the pews, much to their hushing parents’ chagrin. Life behind the mechitza offers some much-wanted and rarely-found protection from the eyes and ears of the regime. It is there the women and I speak beyond a whisper, and before the Lecha Dodi prayer, I feel a hand on my arm, grasping desperately for my attention. Her words are sad and real and stark, and they break the wall put up by her masters. I nod but fail to answer; I see a glimpse of her life but fail to fully understand; and I know there is nothing I can do but say a prayer and tell her story. After services, my translator ushers me out, and as the diners gather we slowly make our way to the Haroonian family home for Shabbat dinner. I’m walking alongside the women, and the natural physical distance between the sexes offers a rare opportunity to speak without constraints. I ask them in broken Hebrew if they are really allowed to visit Israel or even make aliyah as I had been told. Another woman in the group tells me that Iran has the world’s highest number of agunot—Jewish women separated from their husbands but not allowed to divorce. I am shocked at this notion, as it speaks to a deep desperation—a husband leaving his wife and family behind to flee life in Iran. It is fascinating to see this 2,700-year-old Jewish community that has only related to Israel through text still feel the longing for the land in such a real and powerful way, and while I answer their questions in vivid detail, I am moved beyond words by the innocence and curiosity of their query. Despite the regime’s policy of Holocaust denial and unabashed anti-Zionism, it has failed to sever the bond between a people and its homeland, even with so much at stake. Religiously, the Iranian Jews have prospered despite living under Sharia law. Ironically, it may have contributed to their observance, as intermarriage is punishable by death and religion is hailed as the one absolute they may keep to themselves and each other. As his wife is clearing dishes, Yoram presents me with a gift: a large Jewish prayer book in Hebrew and Farsi, with scribbled writing across the back page. I choke up and neither of us says much, but we understand each other perfectly, and as I say my goodbyes, I pray to return safely one day and, if nothing else, that prayer will be heard and answered. As I leave the Haroonian family home it hits me: The overwhelming mix of joy and sadness, of being in Tehran on Shabbat with my people, a scene so familiar and foreign all at once. To a certain degree, the Jews of Iran enjoy greater freedom than I, a European Jew, have ever known. Their synagogues are unguarded, their Jewish identity on proud display, and their religious life lauded and encouraged while mine is increasingly outlawed and oppressed. But their freedom exists inside a large and impenetrable prison, their homogenous traditional orthodoxy that I long for back home is only possible in a place where the alternatives are deemed illegal. But most of all, I am struck by their longing for Israel. My connection to Israel is a backbone, an integral part of my identity as a Jew. 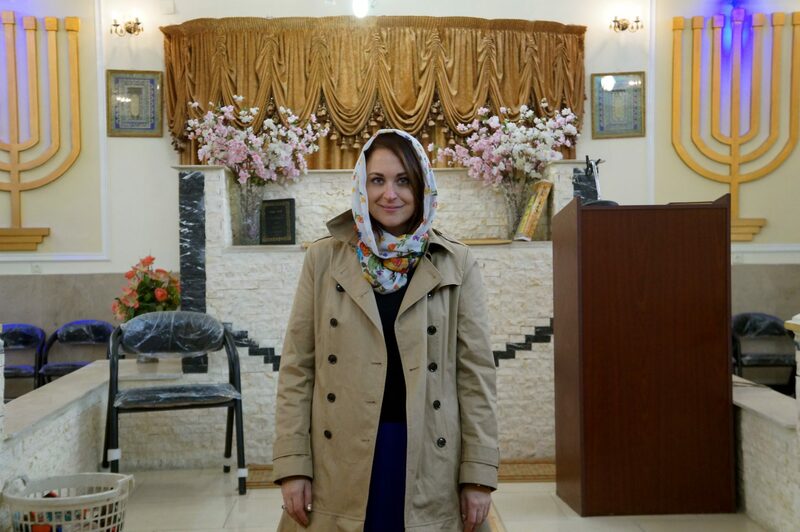 Being in Iran showed me what it would be like to live without it. How completely untethered and unsafe I would feel. On my continent, people are fleeing their homes because they are Jewish, their Jewish identity making it unsafe for them to stay. What if there was no Israel to come home to? What if we were left alone, like shards of crystal, dispersed in the Diaspora? How would we act? What would we be? What would we have to do in order to please our master? I leave Iran with a heavy heart, knowing I may never return to see the people who became family in an instant, because they always were. I worry what will become of them once I board that plane; if I caused them harm by even coming. 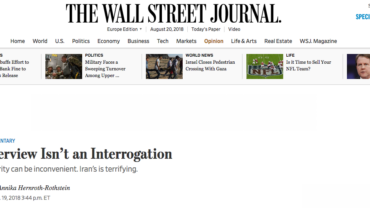 Iran was not what I thought it would be, and Jewish life there is not as hellish as I thought, but in many ways it was worse and more sinister than I could ever imagine. The Jews of Iran are not persecuted, but they are very far from free. They live in a gilded cage with freedoms and rights that can be taken away at the behest of their master without notice or reason. A man is burning right in front of me. He has set himself on fire in the middle of a busy Tehran street. He is screaming about corruption and poverty. My assigned government handler translates some of his ranting. People gather, trying to help him, and I am quickly pulled into a waiting car. Despite his reassurances, my handler is visibly uncomfortable. I turn around and watch the growing crowd disappear in the distance, not sure what to do with what I just saw. It’s my second day in Iran. I came here to cover the 2016 elections and see this enigmatic country with my own eyes, hoping to understand it in a way you can’t by reading books. When I told my friends I had applied for a journalist visa to Iran, they all urged me not to go, warning that the risks were much greater than any possible rewards. I brushed off their warnings, thinking my chances of being approved were too slim to warrant any concerns. After all, I am a Swedish Jew with strong ties to Israel; I have written for plenty of Israeli publications; and my name is associated with Zionism and political conservatism. It was a long shot to begin with; but for reasons I still do not fully understand, I was granted a visa. And then things got real. It’s 4:00 AM and I am standing in the arrival hall of Imam Khomeini International Airport with my two large suitcases, a meticulously tied hijab, and my heart beating frantically in my chest. The government media agency has sent a driver, and from the moment he picks me up and ushers me off with a homemade sign and wordless gestures I am no longer alone. My only time for solitude will be the few hours spent in the relative confinement of my Tehran hotel room. Working on my own was never an option. This was made clear before I even boarded the flight to Iran. Once your visa is approved, you are assigned a government-approved agent to handle your schedule, accompany you to your meetings, and drive you from door to door. There are no real private conversations and no real privacy. As a result, what I take from my interviews are not merely the words, but the silences—what is left unsaid or implied. The agent comes at a considerable cost, of course, as do the plethora of written and stamped authorizations needed to accommodate appointments and plans. Every day, I am asked to spend at least an hour in the office of a government agency to report my movements, and my translator is taken aside to give his independent report. They are then checked against each other, carefully scrutinized for discrepancies. Sitting there waiting for final approval reminds me of worlds I have only known through books like 1984 and Kafka’s The Trial. Iran is governed with what might be described as “freedom with severe limitations,” and this is particularly obvious when trying to contact the outside world. Although current president Hassan Rouhani campaigned on unblocking social media platforms and opening up Internet access, few of these changes have been enacted, something I experienced on election day. The Internet was either blocked—even when using the necessary and illegal VPN app—or its speed was dramatically diminished. These are the same methods of control used during the 2009 election. Naser Makarem Shirazi, one of Iran’s grand ayatollahs, has declared Internet access via mobile phones “un-Islamic.” In July 2014, eight youths were sentenced to a combined 127 years in prison for anti-government posts on Facebook. A year after that, the Cyber Intelligence Unit of the Islamic Revolutionary Guard Corps (IRGC) reported that it had arrested 12 individuals and fined 24 others for having “insulted Islam and published immoral and corrupt material” and “encouraged individuals to commit immoral acts” through their Internet activity. The arrests came after a major surveillance operation by the IRGC in which they are said to have monitored eight million Facebook “likes” in order to crack down on Internet activity that promoted “moral corruption” or featured Western lifestyles. According to Freedom House, the IRGC is known to pressure social media users into deleting content of which the regime disapproves. The IRGC itself announced in 2015 that it had pressured 36 Facebook users to delete 130 pages after it amped up surveillance of the Internet. Everything seems to be monitored in Iran, from Internet access to clothing to movement from place to place. The people of Iran do find ways to get around these limitations. They use VPN and other web-browsing tools that temporarily evade censorship. The most commonly used messaging app is the encrypted service Telegram, notorious for its use by ISIS. 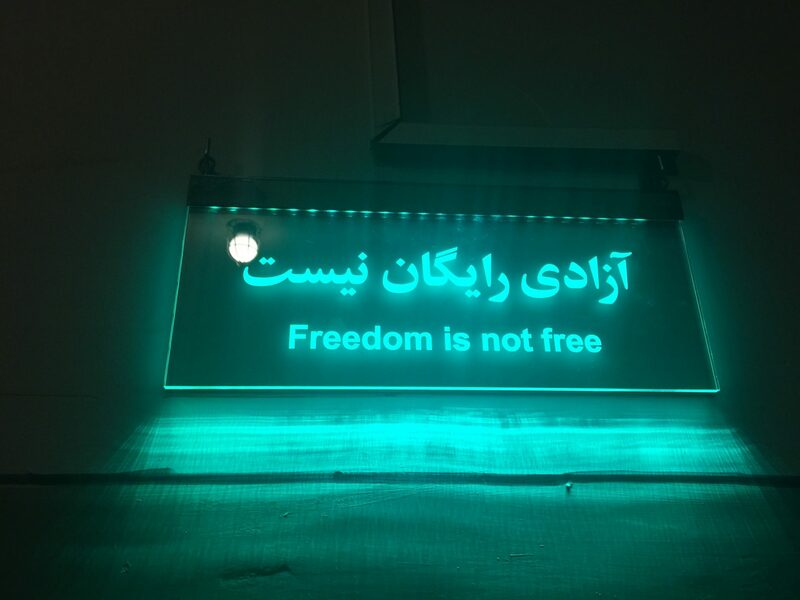 Although it is possible to connect to Facebook and Twitter in illegal ways, Iranians often choose not to send messages through these platforms, as they are much more easily surveilled. Whenever I meet people and we exchange information, they ask me to communicate via Telegram. When I ask them to add me on Facebook or Instagram, I am told that they have accounts but never use them, because the sites are so difficult to access. When they do access them, they have to watch what they post, like, and say. This type of self-censorship is prevalent in Iranian society, and is very hard to quantify. As a result, it is difficult to determine its influence on freedom, speech, and human rights. The regime’s methods of control are well known, and the threat of repercussions is enough to make the people manage themselves. Indeed, the Iranian government is spending a lot of time and treasure on limiting Internet access. The regime’s Supreme Leader even commissioned a “Supreme Council of Virtual Space” in March 2012 to monitor the growing threat of a free Internet. It has been very successful in doing so. According to a 2015 study by Freedom House, the regime has prevented 75 percent of encrypted traffic. As of mid-2015, Reporters Without Borders stated that 26 Iranian citizens remain imprisoned for online activities and, as shown by blogger Sattar Behesti’s death in prison in 2012, a prison sentence can be a death sentence in disguise. The city of Tehran is wrapped in a golden-brown veil of smog. It eases up for only a minute or two when rain falls and pushes the dirt to the ground. I find it hard to breathe, and get winded just walking to and from the car. But only part of that is due to pollution. Throughout the trip, I struggle with the fatigue and anxiety that comes from a sense of constant vigilance, never knowing who is watching and if my actions have compromised me. There is brilliance in this system. The regime never spells out precisely what the rules are, so you are at constant risk of breaking them, trapping you in a never-ending loop of trying to figure out the impossible. On the third day of my visit, I have lunch with one of my handlers. We eat kebab at one of the city’s kosher restaurants. Suddenly, the mood shifts. He puts his fork down and leans across the table. “I’ve been reading your old articles, Annika, reading them very carefully,” he says. My mouth goes dry. I try to answer, but I only nod. Yes, I do, I say. I visit and write about the Middle East just as I said on my application. He’s smiling now, but it doesn’t feel like a smile. It looks oddly misplaced beneath his dark, inquisitive, and intense eyes. I can no longer feel my legs. I’m terrified he can see my heart beating in my throat. I wonder what will come next. What has he seen, read, or heard about me? He could not only take me down, but also hurt the ones I love and cherish. I try to go through everything I have written, every detail I may have missed. But the panic is creeping in, and all I can think is that I played this game and lost, and no one will ever know what happened to me. I know what that means. I know what “Zionist ties” and “spy” mean in the Iranian context. And I know that I am more alone here than I have ever been. Now, I can only choose whether to play defense or offense, with no second thoughts, no time to deliberate. I go for offense. My voice is shaking. My handler is smiling at me still. The silence is tearing me apart, little by little. He leans back against the chair, shifting slowly, brushing invisible crumbs off his slacks as he watches me catch my breath. And with that, it was over. I don’t know why it started or why it ended. We went from the restaurant to parliament, and though I had work to do, the conversation stayed at the forefront of my mind. Everything had been OK until nothing was OK, and the warmth and welcome I had felt turned into something unfamiliar to me. I was struggling to make sense of it so I could prevent it from ever happening again. When I got back to my hotel that night I shut down my Facebook account and removed the apps containing messages that I did not want strangers to see. I sent emails to my friends to explain why I was going dark, but then deleted them, suddenly frightened that a faceless middleman would catch the loaded words. Sitting on my bed, erasing everything, I felt silly for this flash of paranoia and tried laughing at myself in order to snap back into reality. But the laugh got stuck in the back of my throat. This was my reality. Though I might have been a fool for worrying, the truth is that I just did not know. I hardly slept that night, and from that day on I maintained a higher level of vigilance. I changed my clothes in the shower every morning, because I was no longer comfortable walking around in my room undressed. I stopped calling home and I no longer used my email or social media for anything other than posting neutral descriptions of my trip, weighing every word and every sentence. Despite Iran’s attempt to project a new, moderate image to the West, the Islamic Republic has recently hit the highest rate of executions since 1989. Under Rouhani, Iran executed twice as many people in 2015 as in 2010, when the hardline president Mahmoud Ahmadinejad was in office. According to a 2015 United Nations report, there are now ten times the number of executions as in 2005. It is important to note that these are official numbers from Iran, and it is likely that the actual number is higher. Iranian officials like to say that most of the executions are related to the country’s strict narcotics laws, but a March 2016 report from the UN Human Rights Council shows that drug-related executions make up only 65 percent of the 1,000 people executed in 2015. According to Amnesty International, Iran is a world leader in the execution of minors, with 160 juvenile offenders currently on death row. Other groups targeted for execution are journalists, artists, and human rights activists who have spoken up against the regime. The most recent and notable example was Iranian cartoonist Atena Farghadani, who was sentenced to 12 years in prison in August of 2015 for allegedly insulting government officials and spreading propaganda. Watching totalitarian societies from the outside, I have often wondered why people do not rise up against this kind of oppression. I naively assumed that this type of regime can never sustain itself over time. 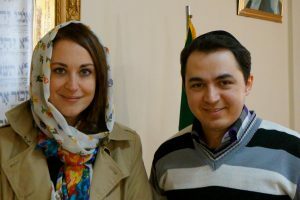 After just 20 days in Iran, I began to understand how wrong I was. I have never been as tired as I was during my time in Iran. I have never suffered such constant low-grade anxiety. It was different from fear of an imminent threat and, in my opinion, much more corrosive. There is a beginning and an end to an imminent threat. What I felt was painfully vague and ongoing. I knew I would leave, that my stay in Iran was not permanent; yet with every new day I realized more and more what it would be like to feel there was no imminent departure, no escape. Iranians are suffering from fatigue, a permanent exhaustion that comes with everyday life under a totalitarian regime. This involves not only worrying about your own safety, but also the safety of those in your community who will feel the repercussions of your actions as if they were their own. It means going from normalcy to public execution in the blink of an eye. It means second-guessing everything and everyone that comes your way. It would be so much easier if Iran were the hellscape I thought it was before I arrived; if the oppression were ugly and clear as day. But what I saw was something wrapped in layers upon layers of gorgeous complexity. Iran is beautiful and warm and blood-chillingly frightening. Its people greet you like family yet both informants and victims are the same. I have rarely felt more at home and never felt so lonely. As I left, there was a part of me startled by the fact that I wanted to stay. This is what Iranians live with. This is the reality they face. The people love their country. They stand by it like a mother and her child, both ruled by a violent and despotic father. They been stripped of the practical and psychological tools they need to escape. So they tell themselves that things will get better; and it does get better, and worse, and they learn to move with those waves of painful insecurity. And that, the constant insecurity, is how the Iranian regime controls its people. It is much smarter and much more insidious than that of other oppressive entities. Much like the Soviet Union, everyone is subject to the whims of their rulers, and everyone is doing what they have to in order to live their lives. President Rouhani campaigned as a moderate, and he may be in some ways, but it is ultimately of little consequence. In the political hierarchy of the Islamic Republic, where all power flows from the Supreme Leader, Rouhani is thoroughly outranked. During his presidency, Iran has seen an increase in executions, a decrease in fundamental rights, and during the 2016 elections there were more candidates disqualified—a whopping 60 percent—than ever before. Those who wield real power—the Supreme Leader, the Council of Guardians, the Assembly of Experts—are showing their “constituencies” that despite having a reform-oriented president, no real reform will come to pass. They are showing this by tightening their hold at the very same time Rouhani is loosening it. There will be no uprising any time soon, nor is there an “Iranian spring” on the horizon. The regime puts its thumb in the eye of the citizens, rather than bullets in their heads. You are promised a decent life so long as you follow the rules, and most of your time and effort will go toward figuring out exactly what those rules are. This, along with widespread socioeconomic strife, leaves the Iranian people with very little energy to spend on politics in general and foreign policy in particular. As a result, the issues most Westerners assume are foremost on the Iranian people’s minds are actually the subject of indifference and ignorance. Those we see standing up to the regime or even leaving to seek a better life abroad are those in a social and financial position to do so. Most citizens of the Islamic Republic are not. This became obvious to me during the elections. Issues of internal policy and the fight against corruption were heavily debated, but the infamous nuclear deal with the West was mostly approached as a way to help the ailing economy, rather than to reform or even overthrow the current system. To rise up, you have to have risen. To demand freedom, you have to know what it is. To think about revolution, you have to be allowed to speak about it. This is a heartbreaking catch-22, and it has captured a once great nation, a nation of people who at this point seek betterment under the rule of the regime, far from dreams of yet another revolution. I still see that burning man, and I hear his voice as he screams in a language I cannot decipher. I want to believe that he is okay, that my handler did not lie, and the man did not meet his death in anguish and desperation. I want to believe that, knowing how naïve and stupid it sounds. I want him to be okay, but I just don’t know. In a 2015 interview with Jeffrey Goldberg of The Atlantic, President Barack Obama made his case for the nuclear deal with Iran. Despite its virulent anti-Semitism and other forms of extremism, he said, the Tehran regime “is practical, and is responsive to incentives, and shows signs of rationality,” and that this would likely lead to its compliance with the terms of the deal. He also said, in an interview with Thomas Friedman of The New York Times, that the ascension of Hassan Rouhani to the presidency, which he described as a victory over the so-called “hardliners,” opened up the possibility of a new relationship between Iran and the U.S., creating a political environment in which dreams of the future surpass grudges of the past. 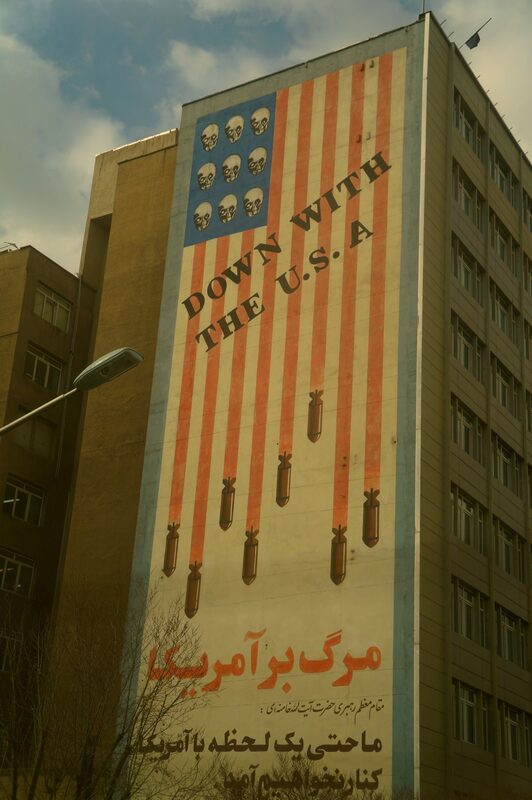 With a deal signed and passed, I traveled to Iran earlier this year to find out whether Obama was right. I’d heard horror stories about what to expect. What I actually witnessed was something far more interesting, more complicated, and more unsettling. fulfill a dream. I have come to find Queen Esther. a day that is holier to us even than the solemn Yom Kippur. 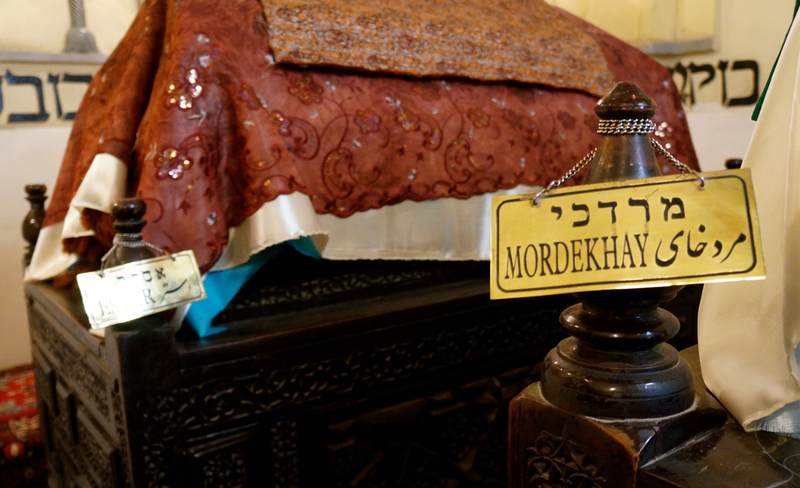 where Esther and Mordecai are buried. before I turn back around. spelled out in the letters of three alphabets. but also by the passage of time. We are still here, I keep thinking. every feeling I felt was in worship. walks up to me, putting his hand on the top of my head. this faith and this moment. shoulders of giants and that day I got to pray at the feet of their graves.